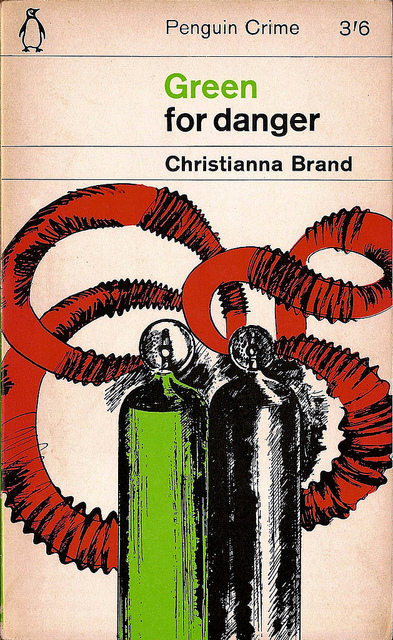 Picked up as part of my vintage paperback haul, the overwhelming opinion from other crime fiction enthusiasts was that Green for Danger by Christianna Brand was a classic of the genre. I found the biography of the writer inside the front cover fascinating. Christianna Brand worked a nursery governess, night club receptionist and model in Bond Street dress shops until she turned her hand to writing after she began fantasising about doing away with an irritating colleague. 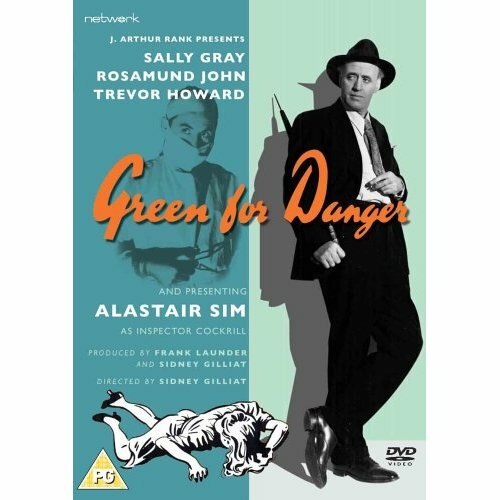 Green for Danger is set in Heron’s Park military hospital during the Second World War. A disparate group of seven protagonists are introduced to the reader in the opening chapter, through the device of a postman delivering their letters to the hospital. These include a consultant and his anaesthetist, a surgeon and a nursing Sister and three VAD volunteer nurses. These hospital workers constitute the group of suspects who come under the suspicion of Detective Sergeant Cockrill when the postman, Joseph Higgins, dies during an operation. Although his death is initially ruled an accident, Sister Marion Bates declares that she has proof that Higgins’ death was murder, and soon she is also killed. 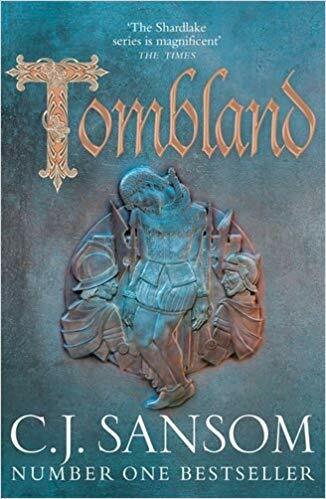 The book was a good solid read although I think I found the first half of the novel more enjoyable than the second. The build up to Higgins’s death was expertly done, with enough information given about each of the future suspects to see the individuals beyond their professional guises and as people with personal histories that were relevant to the murder. The tension was gradually built up and came to a head with the second murder. The second half of the book, dealing with Cockrill’s investigation, dragged a little although much was made of the interweaving relationships between the characters. Clearly hospitals have always been a hotbed of romance and broken relationships. When the eventual culprit was revealed it was slightly too melodramatic for me and I wasn’t entirely convinced by the explanation. The greatest strength of this book though was the depiction of working in a wartime hospital; taking shelter from the raids, working tiring shifts and coping with whatever casualty is admitted. The book was also good on the position of women in the hospital, enjoying their freedom away from conventional society but becoming entangled in difficult love affairs. Overall it was en enjoyable read and I can see why it has become a classic.It reminded me a little of PD James’s Shroud for a Nightingale and I’d forgotten how hospitals can provide such rich pickings for crime fiction plots. The book was made into a 1948 film starring Alistair Sim as Inspector Cockrill and has also been highly praised. Thanks Moira. I agree that the wartime atmosphere was wonderful. If anyone wanted to write about nursing during this period they would find a wealth of detail. I’m adding your blog to my feed – thanks for bringing it to my attention. Sounds a very interesting book. From your review it seems that the book has a fairly typical structure for the crime plot (perhaps in later times more than then), ie a case that takes up half the book in purusing all angles/characters, then a second murder happens that allows the detection/solution. If you are interested in WW2 hospital settings, then the second in Laura Wilson’s Stratton trilogy is set in a London hospital during the bombing (in part). The title escapes me for the moment, but the first is called Stratton’s War and her website is good if you want to check out the series (4 so far). There are also echoes of Ian McEwan’s Atonement in your review. I hadn’t thought of Atonement, Maxine but you’re right, that level of detail was also there with the McEwan book. I’ve read some of the Stratton books and I’d like to pick up the series again sometime when I get a chance. I didn’t read the book but saw the movie, which was interesting. I actually was irked at the subordinate treatment of the women nurses inside the hospital setting. A friend who is a retired nurse had to put up with so much sexism at work that I cringe at seeing this in solidarity with her. However, it was more than 70 years ago and things have changed — somewhat. The movie was fun. It’s worth seeing. I can understand the sexism – nurses in uniform have long been the subject of lurid treatment but in this book you did get to see the other side – girls bored with their lives doing something useful. As you say, at least times have changed! I loved Green for Danger, particularly the idea of the suspects being introduced via the postman delivering the letters, and I enjoyed London Particular, but my enthusiasm for Christianna Brand paled significantly when I read Heads You Lose, which was so awful, and so disappointing, that I would now hesitate before picking up another of her books. Oh dear – I hate it when that happens. I’m going to give ‘London Particular’ a go and after that we will see. Thanks Sarah. I’m amazed at how many people have already read this author. She was completely new to me. Sarah – An excellent review, for which thanks. I agree 100% that Brand does a terrific job of building up the story to the point of Higgins’ death. I also liked the sense of claustrophobia as the various suspects realise that they are all under suspicion and that Cockrill is getting closer to the truth. You’re absolutely right that the sense of what it was like to work in a wartime hospital is conveyed clearly. I’m glad you enjoyed this one. Very nice review, Sarah. I didn’t know of this book until I read your review, but I have faint memoires of seeing the Alistair Sim film when I was very young. I intend to read the book now. Thanks. Thanks Dorothy. I get the impression from reviews that the film is a slight pastiche of the book but I want to see it for myself first and decide. The film was good too though the murderer’s identity didn’t come as much of a surprise – they cast someone with an incredibly distinctive voice so when you hear the radio broadcast you know who it is! Yes that’s what I’ve been led to believe – that the directors weren’t much interested in the whodunnit angle, more a wartime hospital drama.